The German, Chicago-based duo, Beate Geissler and Oliver Sann, investigates themes of human agency, ownership, placement, and displacement. Geissler explains that an interest in “mise-en-scene” or the stage-like arrangement of visual elements characterizes her approach to photography. Correspondingly, her work with Sann emphasizes ways in which viewers occupy the pictorial world. Geissler’s and Sann’s series the real estate (2009) is a meditation on belonging—who belongs where and what belongs to whom. 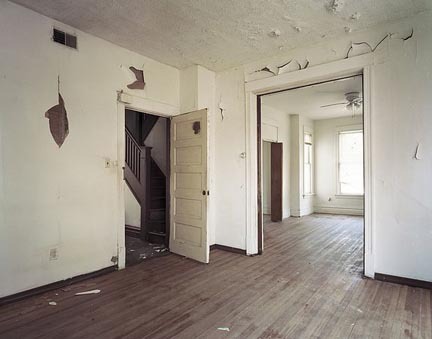 This body of work, consisting of sixty color photographs, features interiors of foreclosed residences that Geissler and Sann encountered in Chicago after moving to the city during the financial crisis of 2008. At this time, the percentage of the nation’s homes that were vacant and for sale or rent was at historic highs. Feeling somewhat displaced themselves as new arrivals to the United States, the artists began to reflect more deeply on what it means to be uprooted and to explore the link between familiarity and feeling at home. These tensions are apparent in the image, the real estate # 11. Here, a sense of hominess conflicts with one of emptiness, underscored by torn walls, blank windows, and the low angle view of wooden flooring. The openness of this floor creates room for the viewer to imaginatively insert his or her body and thereby identify with the house’s former inhabitant. Through evocative spatial relations and associative traces, the photographers signal the presence of the missing homeowner. In 2015, the artist duo was invited to create work for the MoCP exhibition Petcoke: Tracing Dirty Energy, which featured works by artists in response to the environmental and public health impact of petcoke, a dust-like waste product containing carbon, toxic heavy metals, and other dangerous compounds resulting from oil refining processes in the Chicago region and beyond. Choosing to highlight the invisible systems global commerce and their impact on everyday individuals, Geissler and Sann sealed petcoke collected on Chicago’s Southeast Side inside a Plexiglas case in a gallery within the museum. The encased sample was measured based on a calculation that determined the volume of petcoke per square meter if all of the petcoke produced in 2014 were evenly spread across the United States. 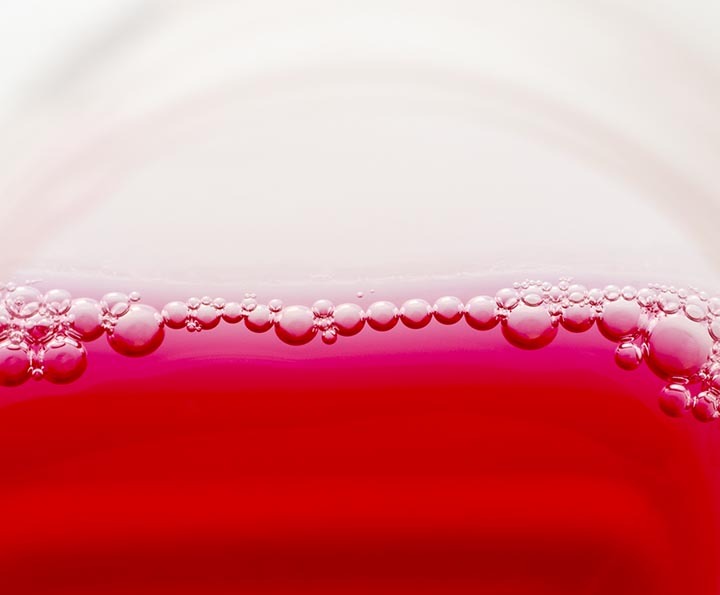 For the same exhibition, the artists created a photograph of methadone, the opioid elixir commonly used to quell withdraw symptoms in heroin users. The artists use the substance as a metaphor for fossil fuel addiction and the need for a methadone-like remedy to curb our collective dependence on oil. Methadone is taken in decreasing amounts over many years. This method of careful, long-term reduction mirrors cap and trade programs, which could be a model for cutting greenhouse gas emissions while also sidestepping devastating economic impact. Many people never fully wean from methadone and must take the therapeutic drug throughout their life or risk relapse. Similarly, Geissler/Sann’s photograph suggests that a path towards carbon neutrality may be an elusive goal. 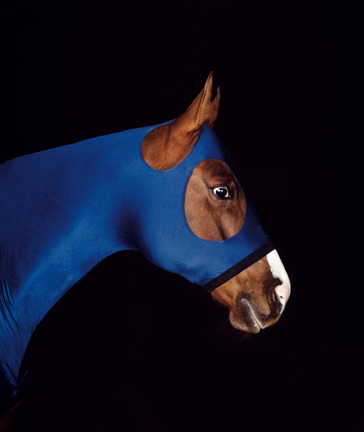 Beate Geissler studied photography at the Staatliche Fachakademie für Fotodesign in Munich (1992) and then attended the Staatliche Hochschule für Gestaltung in Karlsruhe (1994-2000). She is the recipient of the Schroff Scholarship from Zentrum für Kunst und Medien, Karlsruhe (2000). She has taught at fStaatliche Hochschule für Gestaltung Karlsruhe (2000) and currently acts as Area Coordinator and Assistant Professor of Photography at the University of Illinois. Oliver Sann graduated from the Academy for Media Arts in Cologne (1999). He is Instructor of Photography at the School of the Art Institute of Chicago. 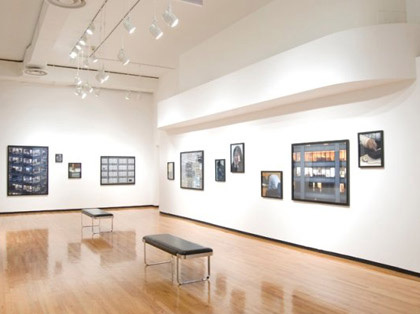 Geissler’s and Sann’s work has been exhibited at Neue Gesellschaft für bildende Kunst, Berlin; Gallery ftc, Berlin; and the Renaissance Society, Chicago; among others.